As members of Wycliffe Bible Translators Gift and Kathryn believe the best way for people to meet Jesus and grow as Christians is to hear or read God’s Word in their own language. Translating the Bible leads to transformation in people’s lives, churches and communities. Gift and Kathryn are based in Uganda. Gift has the role of Partnership Co-ordinator. 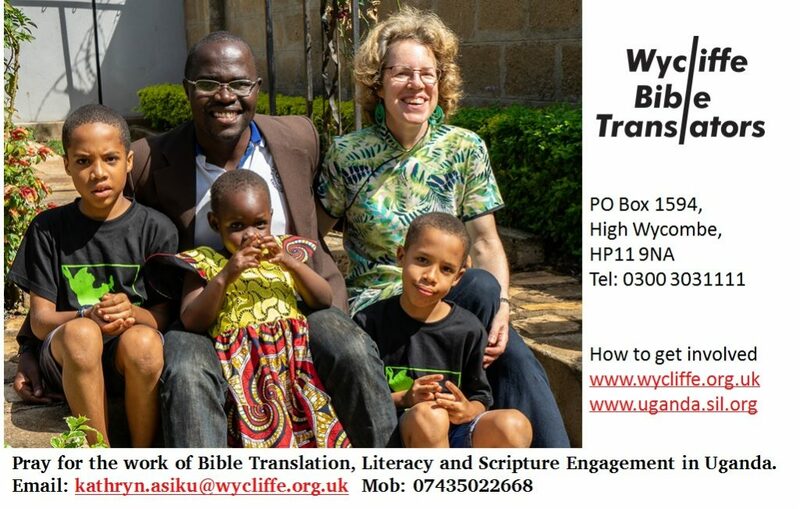 This involves meeting Church and community leaders to share with them Wycliffe’s vision for Bible translation, literacy and language development in minority languages. Kathryn works part-time as a Literacy Assistant to support Bible Translation projects. These translate Bible stories and study guides, as well as books about HIV/AIDS, health, clean water and primers for teaching reading and writing. Kathryn also does desk-top publishing work to prepare materials for publication.